Twenty-one people who occupied a power station for a week have avoided custodial sentences. The group of 12 women and nine men was charged with aggravated trespass after the sit-in at EDF Energy West Burton, in Nottinghamshire. Sixteen of them were given community orders and five a conditional discharge at Nottingham Magistrates' Court. 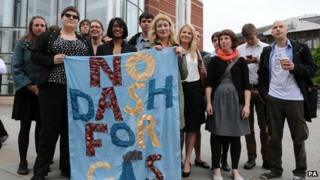 The campaigners from No Dash For Gas said they were against plans to build 20 gas-fired power stations. The group had admitted aggravated trespass, at court in February. The defendants entered the power station during the early hours of 29 October. Over seven days they camped out at the top of two 300ft (90m) chimneys and installed a makeshift zip-line to transport supplies between the two chimneys. Nottinghamshire Police arrested the protesters between 29 October and 4 November, when the protest came to an end. District judge Leo Pyle said the "mass act of aggravated trespass" had resulted in the loss of around £340,000 in labour while delays in finishing the site cost £5m. Earlier this year EDF abandoned a lawsuit against the protesters, seeking £5m for damages, cost and disruption. The judge said many of the defendants were highly educated men and women who had caring roles in the community, but added: "Your motives were genuine but you knew what the boundaries were." Speaking after the sentencing, defendant Rachael Thompson said: "Although - thank goodness - none of us are going to jail, we are still facing penalties for simply standing up for clean, safe and affordable energy." An EDF statement issued after the sentencing said the firm had "invited a range of groups and individuals - including No Dash For Gas - to discuss the company's response to such demonstrations in future." Claudia Comberti, 26, Stanley Road, Oxford. The defendants were each told to pay costs of £85 and a victim surcharge of £60.